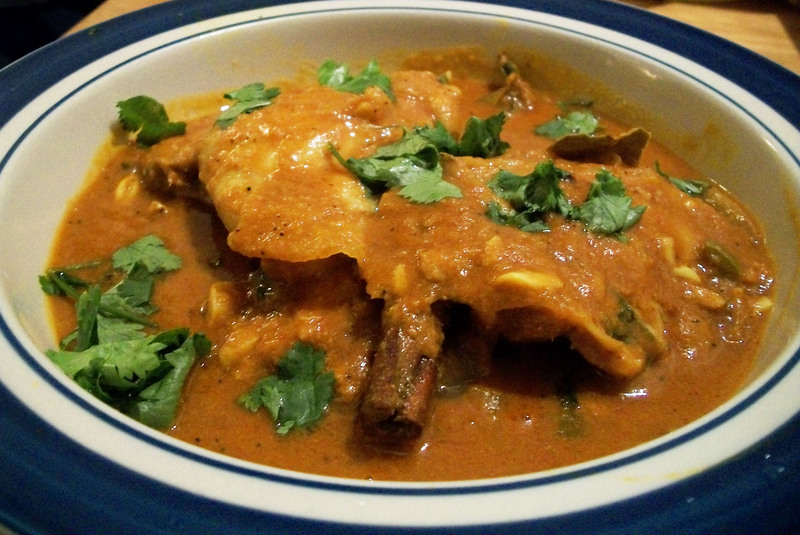 The label “curry” is often used to describe dishes from the Indian subcontinent. The word may be derived from the Tamil kari which means sauce according to Slate.com. Unsure of how to describe the dishes they encountered, British traders in the 17th century referred to all savory dishes as curry. A curry, as the Brits defined it, might be a mélange of onion, ginger, turmeric, garlic, pepper, chilies, coriander, cumin, and other spices cooked with shellfish, meat, or vegetables. This version of chicken curry incorporates coconut milk to provide a creamy contrast with the mildly spicy sauce. Many recipes include garam masala, a common spice mix featuring whole cardamom, cloves, cumin seeds, cinnamon and other variations. By pan roasting the first five items on the masala list we’re creating our own. Since fresh tomatoes here on the U.S east coast aren’t great in the winter, tomato paste works as a substitute. Feel free to ratchet up the spices based on your own taste. The marinade isn’t mandatory but it helps to deepen the flavor. In a wok or a pot add in onions, bay leaves, cloves, cardamom, cinnamon stick, and if desired, chopped hot chillies. Turn heat to medium low and allow to cook for about 5 minutes, stirring occasionally. Once the onions begin to wilt add in cumin seeds and ginger paste. When cumin sputters after a minute add in chicken pieces. Cook for a few minutes on each side till the chicken is cooked on the outside. Next, include a cup and a half of water, and all remaining ingredients except the butter and cilantro. Mix in well and cover for about 20 minutes, stirring occasionally. Taste and adjust seasoning as necessary. When the chicken is cooked add in the butter and cilantro. Serve hot with rice. my husband and I love curry! Awesome. I hope you check out the recipe. I salute your good taste in food haha. Thanks for the comment.